Valentine’s Day always offers me the opportunity to reflect on the meaning of LOVE. As much as I love receiving flowers, chocolate, and gifts in general, in my opinion LOVE is not about tangible gifts. For me, LOVE is an amalgamation of feelings and intangible qualities that are often easier felt than explained. Some of the words that come to mind are respect, support, empathy, devotion and cooperation. These words not only make me grateful for the LOVE I have in my life, but also for what I do as a Birth Photographer. I often have the opportunity to witness these qualities of LOVE in people as they partner together in labor and meet their child for the first time. I get to observe, capture, and organize these to tell their story. When I arrived at Baby+Co for baby Caspian’s birth, I had not had the chance to meet dad (to-be) yet. 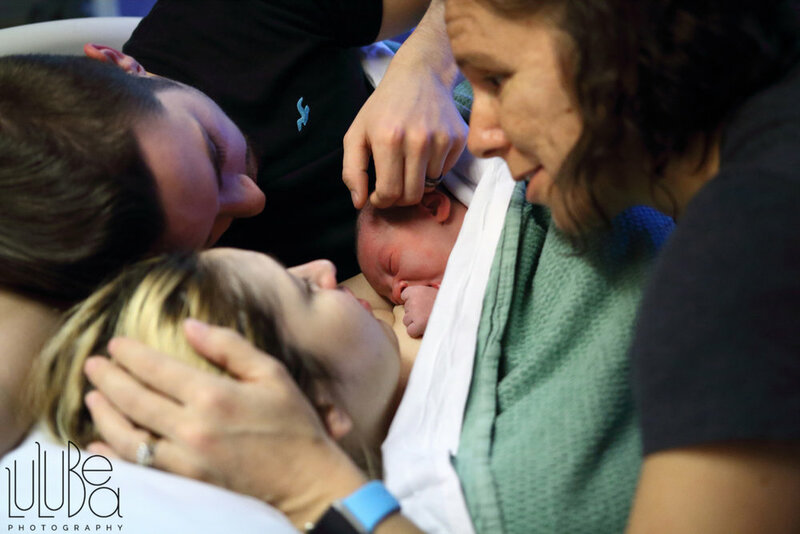 As I quietly made my way into the birth space shorty after midnight on December 26th, the connection between April and Clayton stood out immediately. From the moment I arrived to the moment that Baby Caspian made his entrance, Clayton was by April’s side. He moaned with her through each contraction. He braced her when she felt weak. He validated her when she was strong. He encouraged her when she felt scared. Once baby Caspian was born, Clayton continued by April’s side, showering her with kisses and affirmations of her power and their baby’s beauty, and even climbing into bed with April and their new baby. In the 10 hours I was with them, the only time Clayton left April’s side was to get her something she needed. I captured images of selfless LOVE and teamwork. Their collaboration created an environment of LOVE for baby Caspian to enter. I can’t think of a better introduction to life.